The last couple of years have been busy for percussionist Vanessa Tomlinson and pianist Erik Griswold of Clocked Out Duo. They have performed individually, as a duo, and in collaboration with a range of other musicians, artists, writers, dancers and theatre performers—in China, Korea, the US, UK, Perth, Melbourne and Adelaide, as well as appearing at the London Jazz Festival and the Shanghai International Festival. They’ve recently released 2 CDs: water pushes sand (their second CD as Clocked Out Duo), and More than my old piano, Griswold’s second solo piano CD (reviewed on earbash, www.realtimearts.net). Now based in Brisbane, where Tomlinson is Head of Percussion at Griffith University, they are collaborating on a new project Bridge Song with new media performance group Bonemap (profiled in RT 54). And in the midst of all this, they’ve recently had a son. 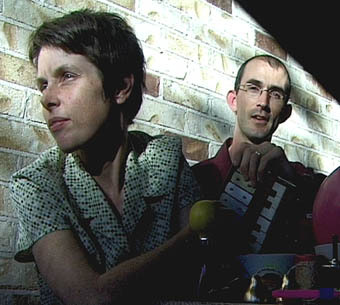 I recently saw Clocked Out Duo at a series of “house concerts” staged at an Adelaide artists’ cooperative. Pitched in the space where vaudeville and Dada intersect, the concerts involved a stunning variety of musical styles and theatrical gestures. Sitting astride an enormous balloon, Tomlinson performed a virtuosic solo that coaxed a surprising range of moods from the unusual ‘instrument’, from the low rumbling of a motorbike engine, through crisp violin-like notes to the wavering ethereal sounds of the theremin. One of Griswold’s piano solos, in the tradition of the one-man-band, simultaneously combined prepared piano, toy piano and melodica (a kind of toy keyboard instrument with a tube and mouthpiece, like a miniature melodeon). Duets involved Tomlinson drawing on her impressive collection of percussion instruments, from the tam-tam (an enormous gong) through to the tiny sounds of tinkling shells and ceramic bowls, while Griswold extracted a similar range of colours and intensities from the piano. Collaborations with other performers involved, among other things, bravura choruses of rapid-fire chanted nonsense syllables, Fluxus-inspired interventions where audience members shouted, stamped and clapped on cue, and live phone-in performances from collaborators overseas. However, the remarkable thing about Clocked Out Duo’s performances is not so much their wild eclecticism, but the way they maintain a strange cohesiveness and integrity. Attempting to explain how their collaboration works, Griswold jokingly paraphrases Donnie and Marie Osmond: “I’m a little bit jazz; she’s a little bit classical.” Tomlinson’s background is in the European avant-garde, and reflects her interest in women’s performance art, while Griswold’s influences stem from American improvised music traditions. The pair recently spent 5 months in Chengdu, China, where Tomlinson studied Sichuan opera percussion and Griswold explored the structured improvisations of folk and street music traditions. So, with so many diverse influences behind their music, how do they manage to produce music that is aesthetically coherent? Griswold’s explorations of prepared piano are taking him in 2 main directions. There’s the potential of prepared piano, with its twanging strings and array of wooden and metal percussive sounds, to sound like a quirky folk instrument, reversing serious concert music’s colonisation of home and community-based musical traditions. On the other hand, prepared piano is also capable of producing similar sounds to electronic music. “It’s a way of reclaiming the space of electronic music, raiding some of its sounds and bringing them back into the domain of the acoustic.” Most notably, Griswold’s version of Al Green’s Tired of Being Alone on the new CD sounds exactly like an electric piano in the middle register, with the upper register producing music box effects, while the lower register sounds like a twanging acoustic bass guitar. Attempting to find ways for the piano to express sounds that are apparently alien to it is one way Griswold keeps exploring the boundaries of the instrument. “We spent a long time developing a musical language in which the balloon and the piano could interact. It’s one of the more difficult things I’ve ever done on piano. The musical language we developed was based on spoken languages, especially Vietnamese and Chinese, which, with their rising and falling tonal inflections, have a certain melody built into them. It makes it natural to adapt them to music.” Tomlinson had to develop a clear understanding of the balloon’s musical language before they could work with it as a duo. “I ended up with 12 sound groups which I then taught to Erik. We’re both interested in discovering the dormant sounds within things, and this was the perfect example—first finding the sounds within the balloon, and then finding the balloon sounds within the piano. In other words, the balloon taught the piano how to play the piano.